For those of you who know me, you will understand that “new connections” is a way of life for me. In July, I linked with several organizations to further my life goal: Be the greatest expression of love everyday. As a result of my work in June with Aproquen, I contacted another ex-pat, Rodney McDonald, who lives in Estelí and has an NGO called Emergency Response Services for Latin America-ERSLA. ERSLA brings in fire fighting equipment from the US, organizes volunteer fire departments, and to my delight gives fire prevention programs in schools in Nicaragua. Rodney and I will be meeting either late this month or in September to discuss a potential alliance with Aproquen to give the school programs. Another connection occurred because of the young woman who helped me get the info for the schools where we presented the Aproquen programs. Ditmara Rugama’s partner just opened a new hotel and restaurant in Guasacate, La Jolla Guasacate. This is a beautiful restaurant with excellent food and a peek-a-boo view of the ocean. Two of my friends took me there for a belated birthday luncheon and to meet Bob Eason, Ditmara’s partner. During our conversations with Bob, I mentioned that Sylvia and I were making coasters as gifts. Sylvia said that she is going to kill me for opening my mouth. Bob asked if we could make coasters for the restaurant. Now Sylvia and I have a “sweat shop” sewing business. We delivered 30 sets of placemats, napkins, and coasters this morning. We have an order for 100 more coasters and potential other clients. Syl and I have been cutting, pinning, or sewing everyday for the past two weeks. Fortunately we both love to sew. Sylvia has more sewing tools than some stores and a great Husquevara sewing machine. I just wish I had my Pfaff here too. Maybe next trip I’ll save room and weight for that piece of equipment. A neighbor of La Jolla Guasacate from Washington, DC was referred to me for cuidadora help. The young couple brought his parents to NI and wanted to know if there was anyone capable of helping the older folks. I met all the family this morning as Syl and I were delivering our table linens. Cuidadoras de Personas may have a client in the near future. I still pass out information about the program and have faith that someday in the future people will see the value of caregivers. Two weeks ago, I again volunteered for the Dentistas Sin Fronteras from Spain who set up clinic at FunLimón. This year I did the intake portion of the clinic—name, age, and the clinical questions. It was a challenge since some names are very unusual and not spelled as one would think. I kept a piece of paper handy and asked the person in front of me to write their name. How would you pronounce Gieszy, Josue, Jansuwe or Niñfa? There was one boy with the last name of Blake. I couldn’t believe this one as he is as Nica as any native. 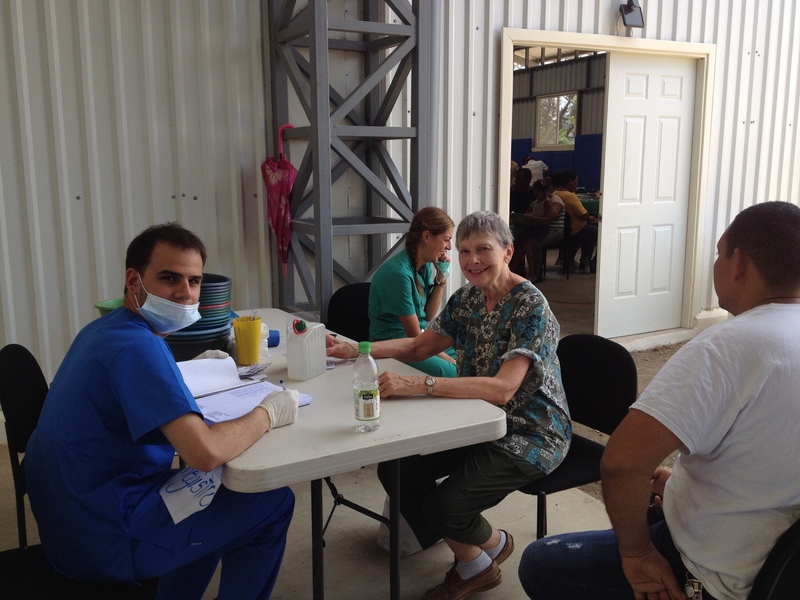 The Clinic was highly successful treating 592 patients in 4 ½ days. Because I have been busy with “work” I haven’t had but two outings outside Rivas this past month, one to Managua to Aproquen and one with my friends Carol and Dixie to Granada to visit a So. CA ex-pat who has houses in Granada and on the beach at Masachapa. 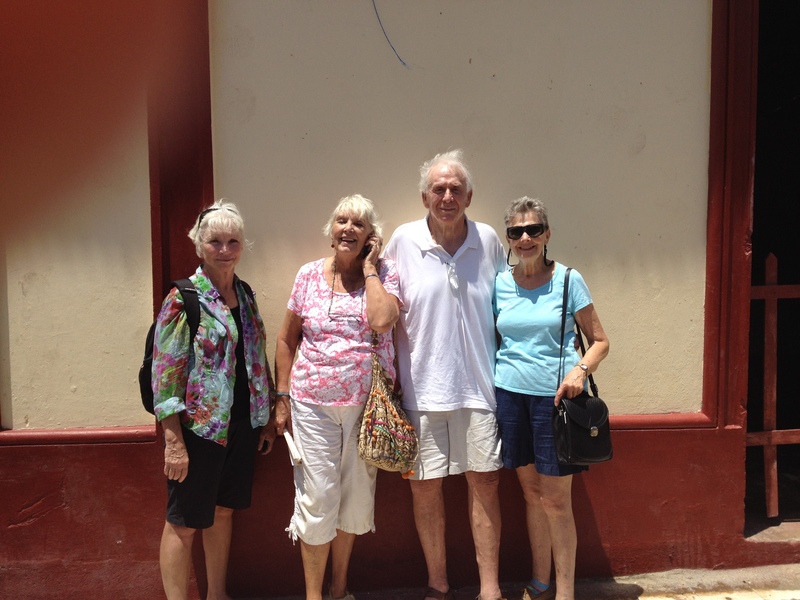 Don Fuller, originally from the UK but lived in Orange County for many years, gave the three of us Damas Doradas (Golden Girls) a tour of Granada and then took us to lunch at a great spot on the edge of Lake Nicaragua (Lake Cocibolca). Don came to visit us this past weekend for three days to see our area, much different than the city life of Granada. Dixie hosted Don in one of the Nica Waves casitas—her son’s surf camp business—and I did the driving tours. We had a fun time and it was a good break from the “work”. It doesn’t look like I will be able to move back to my condo until January 2015. Although I had given a 60-day notice and there is no written contract, I did give my ok last January to rent the condo for another year. Since Rancho Santana can’t find another suitable home for the tenant, I will keep my word. Poco a poco life goes on here. The chickens have baby chicks, the pigs have babies, the dogs have pups and all of them have their special voices at my current abode. There is one neighboring dog that I wish would stay asleep at night and several roosters who don’t know how to tell time as they crow all night long. A new animal visited me yesterday. I found a bat attached to my computer case. He stayed put until I took the case outside and scooted him off. Now I know what the noise was a couple of nights ago in the house. I have no idea how he got in as I do have screens on the windows now. Yes, this is Nicaragua and I live in the country AND I love it. All is well with my house in West Sac. Leah is the BEST property manager. Hopefully the current tenant will move August 15th so that Leah can get the house ready for the new tenant to move in on September 1st. Lots of Candy Crush and other computer games keep my fingers going when I am waiting for someone. I hope that those of you who read this blog will stay in touch and someday visit my Third World Paradise.